Apex’s vision and mission is to create guaranteed measured value for all its clients. To deliver on this guarantee Apex has developed breakthrough science, implemented the science in proprietary technology and created a mission oriented team, culture and processes. In our renewal revenue subscription pilot with TheStreet, a media company we delivered outstanding value, their Executive Director of Marketing Jill Marchisotto in https://www.pubexec.com/article/thestreet-com-used-data-modeling-boost-renewal-rates-price/ says "Over the last two months for all the products," said Marchisotto , "renewal rate is up two points versus control. And our average price is up more than 20% using the pricing model." Chart below is the results of the control vs. test conducted by TheStreet on five of their premium products. 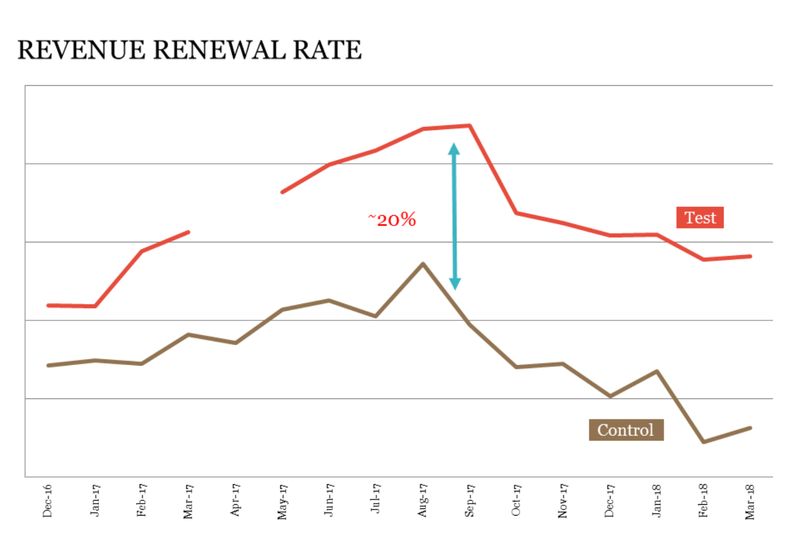 In the chart below the red line is the revenue renewal rate for the test subscribers and the blue line is the rate for the control. The Street has seen a large uptick in YOY revenue, conversion rate and average price since starting to work with Apex. How does the Guarantee and Apex Pricing work? Apex charges an upfront fee to build custom models for pricing for the client’s business objective based on their unique business environment, historical data availability and operational requirements. Once the pilot goes live Apex charges 50% to 100% of the impact created during the pilot phase. 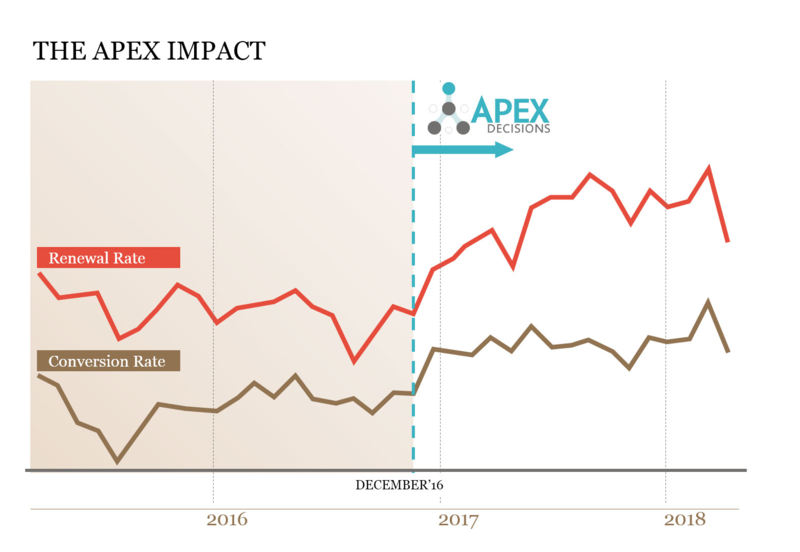 Once the client and Apex are satisfied about the business impact created and move on to implementation phase, Apex charges 15% of the expected impact. The only commitments the client makes is to allow 6 months of pilot period for Apex to fine tune the models. If Apex is not able to achieve the guaranteed benefits, the client can cancel any time after the 6 months with no further obligations. If Apex achieves the guarantee, we require the client to continue the implementation for a period of 2 years.